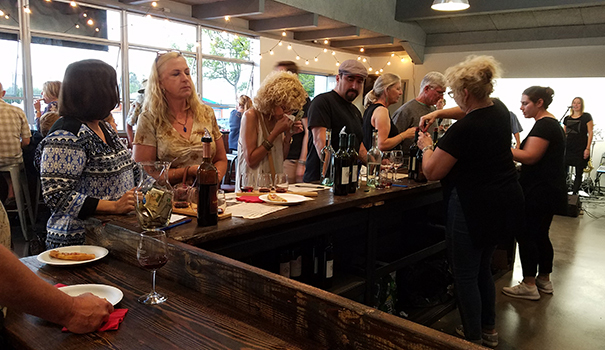 A winemaker, an industrial psychologist, a city farmer and his wife literally committed their blood, sweat and, well, wine, to open a new tasting room in La Mesa. 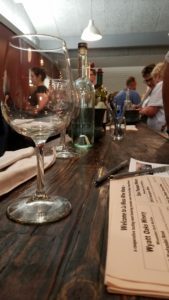 La Mesa Wine Works, a cooperative tasting room between San Pasqual Winery and Wyatt Oaks Winery, wants to create a different type of venue to put La Mesa on the map for wines and brews. 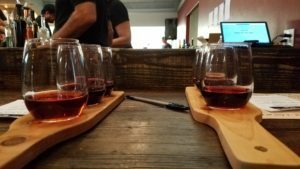 “I think if we get to be known as an area of breweries and wineries, I think that will just attract more customers and become a destination place where people can come and taste beer from a couple different breweries and wine from a couple different wineries and then maybe more will join,” said Mike McWilliams, co-owner of La Mesa Wine Works with his wife, Linda, and president of San Pasqual Winery. He’s also an industrial psychologist, providing services to the Space and Naval Warfare Systems Command (SPAWAR). The location will host live music, trivia and food truck nights. The wineries each feature six wines and sell by the bottle ($18-30) and the glass ($7-9). Customers can taste any three wines, a flight, for $10. Mike and Linda McWilliams chose a wine bar as a retirement project after their initial idea of a Champagne bar fell through in 2008. After buying San Pasqual in 2009, Linda took over as the company’s winemaker. A former speech pathologist, she took classes, was tutored by local winemakers and went to UC Davis’ extension program. For the past two years, Linda has served as the president of the San Diego County Vintners Association. When they joined the Vintners Association eight years ago, there were only about 13 or 14 wineries in the region. Now, there are over 115 commercial wineries in the county, Mike said. San Pasqual was the first urban winery in San Diego city proper, Mike said. This will be their fourth location; they have two La Mesa locations and one Seaport Village location. Their winery produces about 3,500 cases of wine a year. The winery moved to La Mesa from Pacific Beach after changing the area’s zoning to allow alcohol and fruit fermentation. McWilliams credits former Mayor Art Madrid for the zoning change to this day. There are now also two breweries on either side of Wine Works. Gavin and Stacy McClain run Wyatt Oaks Winery. Gavin has been planting and managing vineyards in East County since their first commercial wine release in 2009. Gavin, a city farmer since 12 years old, owns a tree and landscape company. About 20 years ago, Gavin and his father would get grape juice north of La Mesa and ferment it from home for friends and family. Their extended family and three children continue to contribute to the winemaking. Wyatt Oaks Winery distinguishes itself by using local grapes and produces about 300 cases of wine a year. This is their first opportunity to get their wine into a tasting room. The La Mesa Wine Works space at 8167 Center St., a previous manufacturing facility, became available last spring. The owners acted on it in May. The McWilliams wanted to expand from their 4,500-square-foot location across the street to provide more space for wine tasting and barrel storage. San Pasqual Winery has developed a reputation for its passionfruit wines. Their latest addition, a 2015 Rosé of Cabernet Franc, won gold at the county fair, Ramona Valley Vineyard Lum Eisenman Awards and Toast of the Coast 2016; the Rosé also won bronze at the 2016 International Women’s Wine Competition in Sonoma County. Mike said his wife Linda likes to experiment with varietals and will release a Tannat and Teroldego in the near future. She tries not to overly oak the wines to let the varietals speak for themselves, he said. 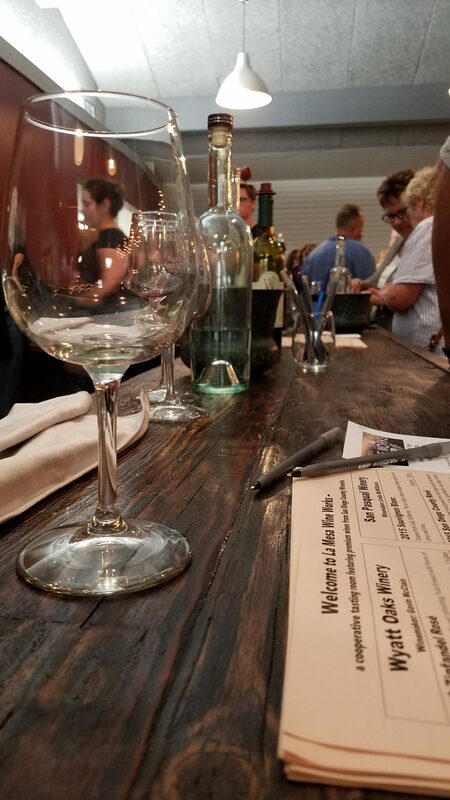 La Mesa Wine Works may consider adding more local wineries to their menu in the future, but they’re currently focused on growing their customer base. The tasting room will be open Wednesday through Sunday in the afternoons and evenings. McWilliams said they’ll continue to succeed because of their great staff, great wine and great customer base. And because, as their latest tagline states, when all else fails, wine works. —Katie Callahan is a San Diego-based freelance writer. Reach her at katie.anne.callahan@gmail.com.